As a middle school teacher in Colombia, I read more than my share of stories written about soccer. Unfortunately, most sports writing, professional or by my students, causes my eyes to glaze over. 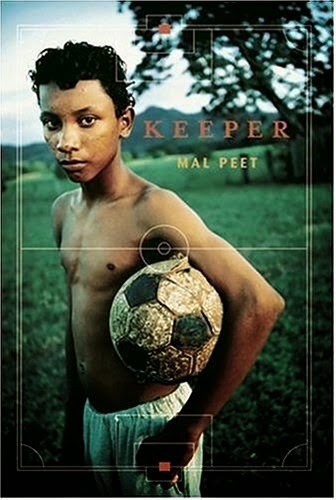 That's probably why I never read Mal Peet's Keeper. I'm glad I read it because I have finally found a sports book I love, where I don't gloss over the descriptions of the games. No small feat. Keeper is the story of El Gato, the world's greatest goalie, who has decided to tell his story to a reporter in the days following his World Cup victory. Paul Faustino, sports writer for La Nacion, is expecting a bonus and a nice headline. He gets way more. Starting the story in his youth in the rain forest, El Gato tells of a mystical figure known only as Keeper, who trains the boy into someone talented enough to get drafted at age fifteen. This is a bizarre premise, but Mal Peet's writing is so strong that I was carried away with the story and read it all in one day. I am so excited to go to school tomorrow and hype it up to all the soccer loving boys who will take away expert tips and hopefully learn about what beautiful sports writing looks like.